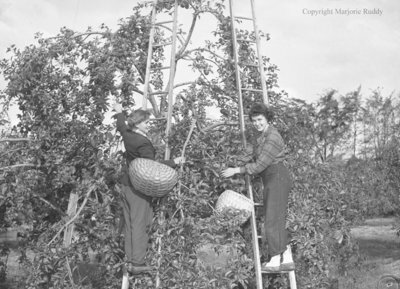 A black and white large format negative of two unidentified women picking apples at Red Wing Orchards. The two women are standing on ladders. G. Norman Irwin (1903-1983) was owner and operator of Red Wing Orchards located at Highway 2 and Lakeridge Road from the late 1920s until 1983. His residence at the orchard was known as Stonehaven. Red Wing Orchards got its name from G. Norman Irwin's plane which had red wings. The orchard is currently Highland Farms, Ajax. Red Wing Orchards, October 14, 1950, Marjorie Ruddy. Whitby Archives A2013_040_227.